Picture this. You are hard at work, chainsaw roaring in your hands, as the sun beats down on you in the afternoon just after lunch. You are cutting down a tree. So far so good. Work is going pleasantly. But suddenly, the saw kicks back in your hands. After that, your work becomes progressively harder. What is the problem? What should you do? Your chain is the problem. It’s too dull. It’s not tough enough. You should sharpen it. And if it doesn’t get better? Replace it. And if you are not well-informed about chainsaw chains? You are in luck. I have done my research, and have here prepared for you a list of the very best offerings in the best chainsaw chain on the market. But before I tell you about those chains, let me give you a short lesson on things to remember when shopping for a new chain. Believe it or not, quality is something that you should absolutely look for when buying the Chainsaw Chains. Today, we are going to take a look at our top 5 Chainsaw Chains in order to help the readers pick the best one out of the bunch. The most important thing to look for in a chainsaw chain is sharp cutters. The sharper the cutters, the faster you will be able to cut down a tree. Ideally, you want the cutters to be tough because you are working on hard surfaces like the strong barks of trees. You don’t want a chain that you will have to keep sharpening too often because it gets too dull way too quickly. The thing to remember about chains is that they are disposable parts. So if the cutters are not sharp or tough enough, you will have to dispose of them frequently. Look for a hard-chromed and heat-treated cutter chain. The chains I review in this article are in the top 5 because they have this quality of toughness and sharpness. You should also look for a chain that has a minimum kickback. What is "kickback"? Let me explain. You’ve probably experienced the following scenario more than once. You are hard at work, cutting a tree or a piece of wood. Suddenly the moving chain touches something very hard, say, a wall, or sometimes it’s the wood that has closed in to pinch the saw chain in the cut. Consequently, there is a rapid reverse reaction which catapults the guide bar upwards, causing the saw to move back in your hand towards your body. That’s a kickback, one of the most trying experiences professionals who use chainsaws have to live with. With a good chain, you will have less kickback. Most of the reviewed chains have cutters that are designed to minimize kickback and make your cutting experience smoother. This Oregon S-Series chain is for you if you want something sharp, that doesn’t lose the edge after cutting down a few trees. You can work for long periods without having to resharpen it. Unless you are hit a rock or something, the chain isn’t getting dull anytime soon. The chain is built to fit chainsaws from the following brands: Craftsman, Homelite, Poulan, and Poulan-Pro. But that does not imply that it will fit all the chainsaws under those brands. Give a call to Oregon Customer Care at 1-800-223-5168 to confirm if it will fit your chainsaw. This heat treated and hard chromed cutter chain guarantees precision cutting. You won’t struggle to get into the groove. Direct the edge of the chain to the bark of the tree, rev up the saw, and get cutting. It will saw clean through the tree. It has a unique cutter design which enables you to cut smoothly and minimizes kickback. That will make working with the chain saw way easier than you are probably used to. The cutters are tough and sharp thanks to the advanced technology used to design and manufacture them. The chain comes with all the benefits of Oregon’s professional series chains but is designed as a consumer style chain at an affordable price. Professional cutters, for instance, arborists and orchardists (with their preference for small size, light weight saw chains) will also like it thanks to its low kick back. Built for performance, quality, and safety. For Craftsman, Homelite, Poulan, and Poulan Pro Chainsaws. Unique cutter design for minimum kickback. Heat-treated, hard chromed cutter chain for precision cutting. 41, 45, 49, 51, 55, 336, 339XP, 340, 345, 346 XP, 350, 351, 353, 435, 440, 445, or model 450e. The dimensions of the chain are a .325-inch pitch and a .050-inch gauge. If you use your chainsaw in a professional setting under demanding conditions, don’t let this great Husqvarna chain pass you by. People who have used it report that it slices through wood like butter. And the chain hardly stretches and maintains its sharp edge admirably. So long as you take care to keep off the bar and chain from the ground, ice, rocks, or snow, the high-performance chain will give you excellent service for hours. Fits most Husqvarna chainsaw models. Excellent for professional use in demanding conditions. It’s always important to make sure beforehand that the chain you are purchasing is appropriate for your chainsaw. This chain will fit both McCulloch and Stihl S55 chainsaws. If you are uncertain that the chain will fit your chai﻿﻿n﻿﻿sa﻿﻿﻿﻿﻿﻿﻿﻿﻿w, you should call Oregon Customer Care at 1-800-223-5168. Note that this chain is manufactured with high-level technology. So the cutters are extra tough and super sharp. Cutting through wood has never been this easy. Satisfied users have only excellent reports about this chain. And that is not all. The cutter design is one of a kind and is specially made to assure you of smooth, fast cutting. The kickback, when the chainsaw jerks after the chain encounters a hard surface, is something most people have learned to live with. But you don’t have to live with it with this Oregon chain. The kickback is minimal. The cutter chain is hard-chromed and heat-treated. Expect precision level cutting power from this Oregon chain. It also has an excellent chip flow. With this chain, you are assured of safety when using, quick and smooth performance, and durability. Fits McCulloch and Stihl S55 chainsaws. Heat-treated and hard chromed cutter chain. Has four-way symmetrical tie straps that make it simple to join chain loops. Guarantee safety, quality, and performance. Minimum kickback thanks to unique cutter design. If you have any of the following Husqvarna chainsaw models, this chain will fit perfectly with your chain. The models include: Husqvarna 41, 45, 49, 51, 55, 336, 339XP, 340, 345, 346, XP, 350, 351, 353, 435, 440, and Husqvarna 450e. The chain has .325-inch pitch and a .050-inch gauge. If you are reading this as a professional chainsaw user who often has to work in tough conditions, this is an excellent chain for you. It will meet all your requirements for a reliable chainsaw. The cutters are sharp, it cuts through wood with precision, it is fast, and you won’t have a lot of trouble with kickback when sawing. It is low on vibration. So your work will be smooth, almost leisurely. With fewer disturbances as you work; naturally, work will begin to be a pleasure. Many professional users who own Husqvarna chainsaws have given the chain a 5-star rating, recommending it to anyone looking for quality, high performance, low-vibration chain. Chains come and go. They are disposable. So over the lifetime of a single chainsaw, you will have gone through many chains. If you make this your go-to chain for Husqvarna chainsaws, you won’t have to replace your chain too many times. Provided you sharpen it well, it won’t give you any problem. Excellent choice for professional users working in demanding conditions. 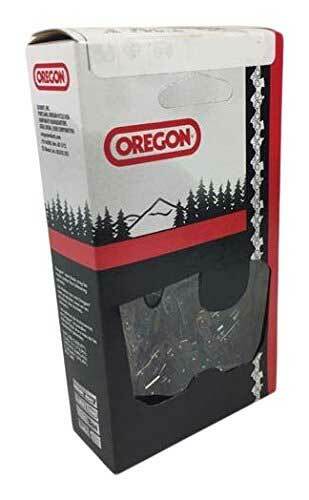 The Oregon S40 chain is a perfect fit for saws from the following brands: Craftsman, Poulan, and Remington chainsaws. It’s worth noting, however, that not all saws from these brands will fit your saw. Some might be incompatible. It is, therefore, prudent that you contact Oregon Customer Care. Call them at 1-800-223-5168 to confirm that your chainsaw is compatible with the Oregon S40. This is a precision-cutting chain. Expect it to give a smooth, sharp cut. Felling trees? Sawing wood? It’s all a piece of cake for the Oregon S40. You see, the cutters have a one of a kind design which guarantees that smooth, fast cut. And to top it all off, the cutter chain is heat-treated and hard-chromed. You will have minimal kickback. And that's why this is the best chainsaw for someone seeking ease of use, convenience, and safety. It is engineered to give you all these benefits; also, you get quality, durability, and performance. The advanced technology used to build it gives you tough, sharp cutters that will make quick work of cutting through the tough bark of a tree. Fit for Craftsman, ﻿﻿﻿Remin﻿﻿﻿﻿﻿﻿﻿﻿gton, and Poulan chainsaws. Hard-chromed, heat-treated cutter chain to ensure precise cutting power. Unique cutter design for smooth cut with reduced kickback. Made to provide quality, performance, and safety. Now you are more informed about chainsaw chains. Remember to buy the chain that best fits your chainsaw. And sharpen the chain when it gets dull. Each of the chains I have reviewed is excellent and unique. Just take your pick.